Expectations of a European Inspector with focus on the country. How to prepare for an inspection with special emphasis to aseptic manufacture. Q & A, panel discussion. Dr. Joerg Neuhaus is currently the Governmental Director on Pharmacy for the German Inspectorate. He is also the GMP- inspector/compliance officer for medicinal products, biologics, blood and blood derived products for third party inspections. He has served as production director for 3M Medica GmbH, Germany and also served as a research and development director in the development of all dosage forms for E. Scheurich Pharmwerk, Germany. Dr. Neuhaus has a Ph.D. in Industrial Pharmacy from the University of Bonn and holds an M.Sc from the University of Bonn. He has special expertise in Biological Products such as bacterial and viral vaccines, as well as conventional medicinal products both in sterile and non-sterile dosage forms. He is also a specialist in validation and inspections. He has served as Head of the Expert Group on Blood Derived Products of the German Competent Authorities and is an expert for several EC task forces and working groups. Dr. Neuhaus has also served as a lecturer for the University of Bonn on Quality Assurance. 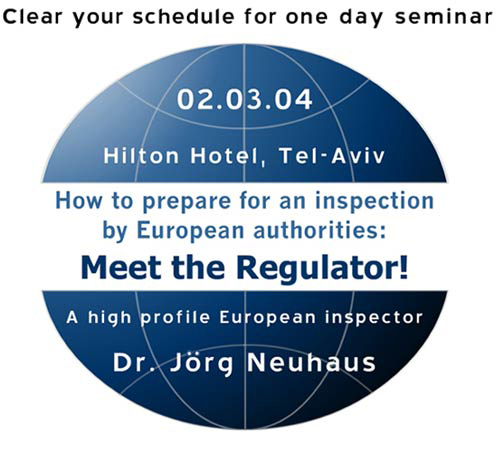 He is a frequent presenter of training courses and congresses in Germany, Europe, and the US and is currently a major contributor to PDA's training program in Regulatory Compliance for the Italian inspectorate. It is for this latter effort that he is receiving this year's Agalloco Award for outstanding performance in education.